To get to the kitchens from the grand dining hall, first one had to find the lesser family dining room. There, as it happened, a score of guards found me. Again they drew their longswords. I had the thought of using my guns to even the odds, but somehow I drew my shortswords instead. Even in such a short span of time, Llrona had made a marked difference in my behavior. For the first time in my life, honor was something more to me than an egotist's excuse for murder. Barsoomian custom has it that husband and wife each have a table, set together at one end as a V. The husband sits at the head of his table, his wife sits at hers, and by joining the two, they sit side by side. Guests sit at one table or the other depending on whose guest they are, while sons sit with the father, daughters with the mother. I provide this detail of dining etiquette only in that this meant there was a very large and ornate slab of wood bisecting the room, forming a sort of wedge between myself and my adversaries. I had happened to come in from the master's side of the room, where the door communicated with public areas of the house. The guards were coming up from the pits, and had entered through the servant's door on the far side of the room. The twin heads of the tables were directly before me, while the wings swept out to greatly inconvenience them, either forming a corral in which they were caught, or forcing them far from my position to reach the other side. I decided to pick the battle field, my greater agility allowing me to leap onto the table as they were rushing to meet me. My goal was not to fight from the high ground, but to force them into the V of the table, and then fight at their back. As they swarmed towards me, I took a step and jumped over their heads, landing behind them with a practiced flip, from whence I closed and began to cut through their ranks with the vim and verve of a ghastly reaper mowing a harvest of blood red wheat. The fighting men of mars are brave and true, and the medicines of the martian people nothing short of miraculous, but being able to survive a sword in your gut does not prevent you from swooning due to the pain. So it was that from twenty, the number opposing me dropped with terrible alacrity, until none remained. I cleaned the gout and gore from my blade, again soiling the fine silk tapestries of this fair house, and gave a bow to Kayla Zo, indicating that she should proceed down to the cellar with me. We hurried down into the access ramp that led to the kitchens and pantries, although I was fairly certain there were naught but servants here. The floor plan of these great houses is always unique, but the basic design logic is universal to them all. There would be a barracks hall, there would be various service rooms such as kitchens and laundry, there would be storage and pantries, and finally, there would be some little cloister, out of the way, typically near the soldier's barracks, that had a large iron door with a mighty lock that was thought to be unassailable. I intended to find, and assail, that door. The very proximity of it to the barracks was why I had gone to such elaborate lengths to announce my presence upon the surface. Now, every guard was on the alert and searching for me up there, leaving me free to exit and find the dungeons. Having rescued Kayla Zo, it was even logical that the Warlord should think my errand done, although I am not so foolhardy or vain as to believe he would automatically fall for every misdirection I had used. It was a brief search, down a straight corridor, which led me to the barracks (the score of men I had fought were apparently summoned from their rest, and had taken the fastest route to the surface). 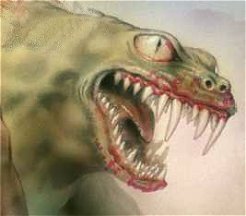 The entrance to the pits was indeed right beside them, and was guarded by a half dozen men who seemed to anticipate some attack from the caverns beyond. I simply stepped around the corner, drawing my short swords as I came, smiling wide so that they could see my white teeth in stark contrast to the wet crimson blood which coated half my face. I kept my back to the entrance, and allowed none of them to pass. They fought at a disadvantage, their numbers penned in by encircling walls, and I cut through their ranks as brutally as the ones I had faced previously, soaking myself to the skin in their gore. Searching the bodies, I found one highly decorated padwar with a set of keys on an oval ring. He must be the one in charge of the prisons, and this also meant that the dungeon was very near by. Finding the correct key, I opened the great iron door, and descended into the pits, the way well lighted in this area for it was a region of high traffic, facilitating movement between certain palaces and public offices for the sake of couriers and nobles. I had learned to avoid this area, for it was well patrolled, and because the prison which held myself and Oro Tavas was in this area, and we neither wished anything more to do with it. Now, I strode confidently, swords drawn, coated head and foot in blood. I had no fear of gunmen, for in these confined spaces no red warrior would willingly use a bullet if his sword were at hand. Three times I was challenged, and three times I strode away victorious, leaving a trail of corpses to increase my infamy. Before I had gone further than a thousand yards, I was once again at that hateful guard post from whence I had only recently fled. There was no honor or nobility bound to this memory, I had suffered no virtuous agony. I had simply been too proud to accept service as another man's slave, and was so bound out of fear. I could have been killed, or I could have been put to work, but instead I was left to rot in a hole in the ground, far from light and life. The sentries on duty in that guard post raised an alarm as I strode in, and I knew that soon hundreds of men would be swarming these halls. Four guards faced me, and I should have been fatigued by this time, wounded, sore, and weary, but still I mowed my gristly harvest. They fared no better than the others, and one ended badly, fear of his own death clouding his judgment, causing him to turn and attempt to flee. I had killed too many men by this time, faced too many brave warriors. Such cowardice sickened me, and I could not bring myself to soil my blade. I broke his legs and arms and left him to his agony, unable to defend himself or even to crawl away. He would be dead soon enough, for I had one last explosive remaining. I moved through every cell, freeing every prisoner as I came to them. I found my friend, Oro Tavas, languishing in the very same cell we had shared before, his drunken binge having led to his recapture. He had never seen me in the guise of Dim Sum, and so I doubted that he would recognize me even were I not covered in gore, but he thanked me just the same and had no care to what city I owed my metal, so long as I freed him from this sepulchre that had become his home. After we had freed the others, including a number of women who had been left in a separate wing, I returned to that hateful vault and left my last surprise chained with the very manacles that once held me. The device represented everything that I had stood against when I was a man of earth. At its core was a small crystal of hydrogen, bound together into a material we called deuterium. This deuterium crystal was at the focal point of a laser, which could reach temperatures far beyond the point at which hydrogen fuses into helium. In short, I had left behind a small tactical thermonuclear device, with which to wipe clean the memory of my incarceration here. It would not destroy the city. It would not even destroy the building built above these vaults, but this dungeon would be utterly destroyed, and the fireball would spread through these pits like the very pillar of fire that sent the Egyptians to perdition. It was a beginning, a small declaration of power. I would have what was mine, and though I was but a slave there, Dar was mine and no man was going to take my home away from me. My route of escape was already planned. We clambered out of the tunnels and I pressed the second trigger concealed in my harness, the one which activated the hydrogen bomb. As I led our rag-tag ensemble of prisoners, brigands, and murderers, I could envision in my head the numbers slowly rolling backward on that device. It was likely that the soldiers had arrived, and were even now examining the strange object which had been left behind. Into a large, low warehouse building, where I saw my ally wave to me. Up the loading ramp to the roof, where a fast ship waited. She was one of the only ones I had designed that I knew to have survived the war with Helium, and at her helm was Car Than. We took to the sky just as the very ground shook, and houses in every direction rattled as if in an earthquake. As many of them were raised up on stilts, I imagine they shook quite a bit, for as has been mentioned before, there is neither strong wind nor seismic activity upon Barsoom, and thus these stresses are not accounted for in the building of houses. In the wake of this explosion and the chaos that it wrought, we made good our escape, the swift ship wheeling away towards a place where we could remain hidden. Llrona fairly threw herself at me once she recognized me from under all that muck, which raised an eyebrow from Kayla Zo. I could see already that this was going to require some delicacy on my part. In my defense, I can say that I had not taken advantage of Llrona, nor given her any idea that I would wish to. I think it was this chivalry on my part, combined with the solicitous air with which I treat nearly all women, that made her feel so passionately about me. I was a master she could serve, and a man she could love, and few things create greater adoration in the human heart than these two factors combined. I could only be sympathetic, in the light of my feelings for Kayla Zo. You may have realized by this time that a change has taken place, that she was no longer Mistress to me. In retrospect, as I write this tale now, I know the point when that transition occurred, but as events unfolded, I was constantly in a struggle to stay alive and remain one step ahead of my enemies. So it was that, until I saw the two women I loved together under the light of the further moon, that I realized that my feelings for Kayla Zo had changed, or rather, than I had changed, and my feelings with me. I still loved her, as passionately as before, but I had taken upon myself a mantle of responsibility which so far I had denied. I loved her, and wished her to be with me, but I could walk away now, if that was for the best. I was, possibly for the first time in my life, a free man. I sent Llrona to the hold below, to find some soap and water that I might cleanse myself. As the vast barren plains of mars hurtled under us, I turned to Kayla Zo and asked her, "what now?" "What is it that Simon Hill, man of Jasoom, wishes?" she replied coldly. "Simon Hill is no more" I told her, with an unconcealable sound of remorse in my voice. "He died that day in the hall of reflection, when he chose to kill rather than be taken captive. It was a long, slow death. I think he started to die the day he met a curious sorak, and then looked into the eyes of its owner." Her eyes softened, I think, although it is hard to tell under the ever changing shadows of the hurtling moons. Turning to view the landscape, she asked me, "did he mean what he said, that day when he died? That so long as Jor Komak draws breath, the Jeddara would not be held captive?" My heart quickened, and I reached out to her, placing my hands on her shoulders as she stood with her back to me. "The Jeddara lives?" I asked, not daring to hope. "She lives," came the reply, "but not for much longer. Before the further moon can rise thrice more, she is to be taken to the Temple of Reward, there to be judged by the Warlord and a tribunal of jeds and jeddaks from countries that he dominates. She will be sentenced to death as an enemy of Helium, and he will claim Dar as yet another jewel for his harness." "So long as the Jeddara lives," I growled, "Dar lives. She must not be executed. I will level all of Helium before allowing that to happen." Kayla Zo turned and looked up into my eyes, which burned with a fire that I only felt for three women. Touching my blood smeared face, she said softly, "I think that you mean that, Jor Komak of Dar." We were interrupted then by Llrona, who had come upon us abruptly. She saw us in this embrace, together under the stars, and a look of hurt comprehension crossed her face. She quickly concealed it, but I knew that look as well, for it too had been for me to experience. I asked Kayla Zo to bring this news to Car Than, and as she departed for the helm, I asked Llrona to assist me in cleaning myself. "Your princess is very beautiful" she said to me, in a voice rich with unconcern. "Not my princess," I told her with a shake of the head. "My owner. She is married to another, and even were it not so, I am but an orad, and she the lady of a noble house, granddaughter to a jed." "You do not treat her like she was your mistress" Llrona commented, as she attempted to buff the blood from a particularly saturated part of my elbow. "I have changed, since last she and I were in each other's company. I do not know what the future holds, for me or for her, or for my beloved city. I do not know if what I felt will ever be the same, though I will do my duty as honor demands." "And what of me?" she asked, looking up from her task and searching my eyes. "What am I, to you, and how will it be, if I am the servant of a slave?" "I have told you before, my precious darling," I said, holding her face in my hands, and looking deep into her wide innocent eyes, "you are a free woman. The gift I gave you had no requirement attached, and from that time you were your own soul. Serve, if you must serve, just as I must serve. Do it with honor, do it with pride, but do it for your own sake, not for mine." "And how do you serve?" she asked, her voice quavering, as she tried to look away. "What obligations have you felt, to follow your calot's heart?" "I have looked into the eyes of the first woman I loved, and in her voice heard the words of command. I have followed her and been obedient to her, in every way that I could think of. In so doing, I learned that it was in me to be obedient, that it was not a requirement of others forced upon me. I was a free man, in practice if not in fact. The first time my orders disagreed with me, I ignored them, and fled my home. My calot's heart led me to rebellion, and back into slavery, and from there to a state that I do not yet fathom. Now, I serve you." "Serve me?" she laughed, tears of pain and confusion in her eyes. "How? How can you serve me, who am your devoted slave?" "By being what you need, my precious servant," I answered her, leaning my head so close to hers that our brows touched. "By being the master that you want me to be." After a moment, I had her return to her task, which she practiced with abandon. In the moonlight, I could see Kayla Zo smiling at me, the same smile she had worn since the very first time we had met. I do not know how much she heard, but I knew how much she comprehended. Ignorance was a parlor game at which we played, leaving unsaid what we knew we could not say, that honor and martian chivalry required be left unspoken and therefore unknown. Our game had a ritual, which we had played out time and again, each of us taking turns in the role of unspeaker and unlistener. It was my turn to unspeak, hers to unlisten, and in that deafening silence, a volume passed between us. Soon, I was again pale and pink, the correct color of an earthman. Certain remedies and cosmetic agents were applied to my scalp, bringing my hair back with forceful abandon. I had wondered why there were so few bald men upon all of Barsoom, but of course the medicines of this world are nearly as refined as the vanity of its people. In an abandoned mine, we gathered and made our hasty plans. Between the lot of us, we could erect a fairly accurate blueprint of the temple of reward, which was the only place we knew the Jeddara was going to be. Had she been in the dungeons, we would have found her, but as I had proven, those dungeons could be stormed. I had no doubt she was in the palace of the Jeddak, or in some other special hiding place. Car Than told me that this was to be a public trial, and so if we could return to Helium before daybreak, we could enter the temple and be ready, mixed among the crowd. I warned him against that, stating that there were means of checking our identities as we entered. The guards would challenge us before the Jeddara had been brought out, and we would never reach her. I had another plan, and it hinged upon Llrona. After constructing the devices we needed and demonstrating them to the assembled partisans, it was agreed that my plan would possibly work. It was also quickly concluded that no one else had any plan that was better or more likely to succeed. So it was that we stole back into Helium by ways known to certain smugglers, (who charge a great deal for this information, I might add), and readied ourselves for the coming event. I stole from a local prince an airship and the banners which declared that vessel to be part of the royal family, with which I hoped to get close to the temple of reward without arousing suspicion. Car Than was placed at the helm, clad in that prince's own regalia (the prince himself lay dead in the hold, for while I did not wish to harm him, neither could I allow him to reveal our deception) while others of our crew stood as servants and guards. Meanwhile, Llrona, I, and several others, dressed in the simple harness of civil slaves, scrubbed clean the great marble hall under the watchful eyes of an overseer who also was an ally. As we scrubbed every surface until it gleamed, we planted devices throughout the room to effect our plan. Our shift ended, the normal working day about to begin, we retreated, seeming to move on to our next menial task. The life of a drudge, after all, is of no concern to the proud warriors who guard the Temple of Reward. Only Llrona and I remained, lurking in those places servants know, occasionally whispering among ourselves that we wished to see the trial. This deception was maintained even though we were not being overtly watched, because I knew how easily we could be come upon, and whomever it was needed to recognize us as slaves, rather than as assassins or rescuers, else all was lost. Soon enough the risers began to fill with spectators. After a time, with great pomp and ceremony, Zamran Gauth, deposed jeddara of Dar, was led to the great hall and taken to the Pedestal of Truth. There assembled thirty three noble personages, jeds and jeddaks of the highest order, for this was supposedly a trial by her peers. It was an execution given the stamp of respectability, and I knew those kings and princes to all be friends of the Warlord, given their kingdoms by him after his conquest of their land. Llrona and I had taken our places, having secured seats among the stands where we might better observe the proceedings, in order to better time our assault. As the ceremony began, a clerk read from a great book a list of all the deeds known to have been committed by the Jeddara, fair and foul alike. She had been alive for a long time, and she had been Jeddara for much of it, so that this was a long and impressive list. A light began to blink on one of my ornaments, a signal that the others were ready. I took my leave of Llrona and moved higher up, claiming that I could see nothing of the trial from where I sat. In the back row, in a hollow under the last riser, were weapons, and as the clerk began to describe the first war in which the Jeddara had taken part, I withdrew my guns, much to the concern of the fellow beside me. I had been counting on someone raising an alarm, and this gentleman obliged me. As he cried out a warning, a ripple ran through the crowd, for no weapons were allowed in the sacred temple of reward, save the thirty three swords of those who stand in judgment, and one more, which lay upon a velvet pillow at the feet of the Warlord of Mars, next to the crown which once our Jeddara had worn. The clerk ceased his reading, blinking up to find the source of the disturbance. There were few lights in this vast and cathedral like hall, save the one fixed upon the pedestal of truth, and the several fixed on the dais where the tribunal sat in judgment. Thus, it was hard for those upon the rostrum to determine what was the matter in the festival seating high up in the stands. An older, regal man with a commanding voice stood, glaring in my general direction, and demanded to know what was going on. My response was to detonate by remote signal a few small explosive charges, and several more smoke canisters, and then stand in my place, high above the temple floor, and call out, "A noble calot bids you gentle sirs good day, but regrets to inform you that as he still lives, you may not yet have the head of Zamran Gauth, jeddara of Dar!" With a flourish, I took to the floor in a few great leaps and bounds, while soldiers of The Guard came rushing in. Masonry cracked in the ceiling, as several of my charges were of a variety to do demolitions, rather than to create distractions, and huge pieces fell away to allow vast beams of sunlight to come pouring in. I already had my guns ready, no thoughts of honor here, and began to open fire indiscriminately, the explosions from my radium bullets thundering in the mighty hall which had been build for near perfect acoustics. 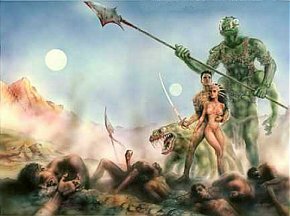 The Warlord of Mars and thirty-two of the mightiest warriors of Barsoom drew their swords and made their way towards me, the Warlord himself leaping through the air and landing very near to my location. I withdrew, holstering my pistols and drawing my short swords. Of all the men upon Barsoom, only he and one other could move as I did, but in that mobility I had the greatest experience and training. Our duel was impressive, worth the while for any spectators to observe, though obscured by a great deal of dust and smoke. As we fought, I somehow found the wind for pleasantries, asking him if his calot was badly hurt by the fall, and apologizing for having given a fright to his lady, but I had only come to rescue Kayla Zo. I did not fight with the ruthless abandon of my previous mission, for that was not the plan. I ducked, dodged, weaved, evaded, and kept all eyes upon me. When I saw that another light had winked on in my harness, I knew the plan to be complete, and I allowed the mighty Warlord of Barsoom to push me back, until we were leaping among the broken columns and rafters of the colossal hall. Reaching the roof, I pressed the gem on my wrist ornament which had signaled to me the beginning of our escapade, and thereby sent a signal back to my allies stating that I was in position. Several more explosives went off, as the royal prince's flyer began its approach. Suddenly turning to the offensive, I struck aside John the Warlord's sword, tagged his wrist so that he let go of the blade, and then turned to leap out the gaping hole in the ceiling, and from there to run along the edge of the building. I needed every last ounce of acceleration, and the mighty Warlord himself was right on my heels. Praying that Car Than was as good a pilot as I believed, I leapt from the edge of the building, and from around the corner came that princely flyer, barreling along at great speed. I caught the deck railing as it sped past and almost felt my arm pulled from its socket. I turned to see the Warlord flailing at the edge of the vast temple, for his speed in giving chase was great, and even he might not survive a fall from so impressive a height as this. "Farewell, Warlord of Mars!" I called out as we sped away, the patrol boats of Helium already beginning to give chase. "Thank you for believing that I was the one to free the jeddara! I could not have done it without you!" Clambering onto the deck and lashing myself in, I laughed to think of their surprise and consternation, for you see, the Jeddara stands there still, thus my rescue was a failure. I wondered how long it would be, before they realized that she was naught but a projected image, with no substance to her at all? We now were being menaced by the ships of Helium, and I could not yet relax. Aboard the escape ship I had secured a firearm, loaded with munitions of a caliber and explosive force to be considered, in earthly terms, the equivalent to antipersonnel grenades. My aim was such that I could propel these deadly bullets with frightful accuracy into the cockpits of the vessels which gave us chase. Zipping through the aerial traffic which clouds the skies of every martian city just as automobiles congest every street of earth, we quickly eluded our more distant persuers, and made our way back to the agreed-upon meeting place. There, we were greeted by cheers and shouts, for Llrona had been successful in sneaking through the riot and, under cover of smoke, cutting through the Jeddara's bonds with the laser I gave her, and then leaving behind the image projector. The hologram was not a perfect one, nor did it need to be, for it needed only to convince the casual observer that I had not whisked away the Jeddara while all eyes were upon my running battle with the Warlord of Mars. In the confusion, Llrona stripped the Jeddara of her fine jewels and, as two slaves who fearing they night be missed by their overseer, they slipped quietly through the servant's entrance and away from the struggle. As we entered the room, some half an hour later, the Jeddara had returned to her fine trappings of gold, platinum, and rare jewels, with one exception. About the neck of Llrona was clasped an exquisite necklace of rubies. The reception was warm and praise was scattered freely, but we were still in the midst of a hostile city. Somehow I found myself in a position of authority, ordering men to their tasks and ensuring that our escape route was still possible. As with other changes wrought by my trials, I did not notice this transition until much later, so I give you this information through the unfogged mirror of hindsight. To me, at the time, it only seemed correct that we save the celebration for after our true escape, and so I began to ask of the others how their plans had fared, and whither our status among our allies. Each, in turn, showed deference to me, and soon the remainder of our plan was under my watchful eye. I do not think I did much more than bow to the Jeddara, to acknowledge her presence, and to ask Llrona if the plan had gone as we had hoped, before I started my orchestration of the next phase. Our way into the city was paved with bribes, and I knew the Warlord had coffers to match. Our way out was therefore paved in subterfuge, a thing about which I knew a great deal. We had purchased passage upon a luxury ship bound for Hastor, that nearby ally of Helium. Dressed and liveried in the metal of that city, we were to be the entourage of a noble lady, in whose role Llrona would sit, returning home after a tour of the twin cities of Helium. I counted on the sheer brazenness of this plan, for no fugitive so leaves the enemy camp. Let them search for unlit flyers and secret passages, we would travel in grace and style aboard a slow cruise ship bound for another land. It was true, to pay for such convenience, I had robbed several automats and stores, as well as a few noble houses, and had committed incidental bloodshed along the way, but even were my plan to be divined by the forces of the Warlord, who would think to search a ship bound for noble Hastor, which has been an ally and orbital state of Helium for nearly a thousand years? What partisan insurgents should choose such a path? It was upon this set of assumptions that I hinged my plans, with bloody-handed conflict as my plan of escape. It was a quiet few days of travel, as the vessel slowly crossed the rolling hills and plains which separated these two lands. I made sure that Llrona was waited on hand and foot so long as any others watched us, but also made certain that she remain undisturbed, and we with her, so that her betters might retain their quiet dignity. In Hastor, we shed our roles, and returned to being fugitives. It was Car Than who suggested our next course of action, and so it was that we left fair Hastor in favor of a less beautiful place, but one which would be friendly to us, and where the remainder of his fleet could be found. We would travel to far off Daxor. In Daxor we found, much to my surprise, that Car Than was now jed, having made good on the destruction of his rival, Borath Veck. The fleet destroyed by Helium was not so significant as we had been led to believe, for years of guerilla warfare had made my friend a crafty man. A hundred mighty battleships were secreted here, including many of the fleet ships of Dar, who had dispersed upon learning of the city's capture. Nearly a thousand smaller vessels stood ready as well, for even in far off Daxor, news had spread of a daring raid upon the city of Helium, and of a mighty explosion that rocked that city to the core. All assumed this was prelude to some invasion, but the discovery that it was instead a raid to rescue our imprisoned Jeddara filled the refugees from our fair home with joy. We had a mighty navy, but what we lacked was a sufficient force of ground troops. Gathering panthans and pirates, assassins and renegades, from every kingdom he could, Car Than was only able to muster ten thousand fighting men. Even to re-take Dar, it was far from enough. In a cabinet set aside for this purpose, I, Car Than, and a number of generals and officers, pored over maps and schematics of every kind, trying to think how we could defeat Helium by aircraft alone. "If only one of the priests had escaped capture!" ejaculated one of the old generals, pounding his fist into his palm. "Had that occurred, there might be a way! ", looking at the old man in surprise. "In ancient times, it was our practice to entomb the greatest warriors of our people in a cavern deep within the sacred mount" he told me. "A preservative was used to keep them in a state so like death as to be indistinguishable, but they may be revived by a priest who knows the elixir of life." "And were they to awaken, how many would these men number?" I asked, a plan forming in my head. 'A million, perhaps more" the general replied, then added with a dismissive wave of his hand, "but the priests are all captured, and the sacred precincts lay in enemy hands. It was but wishful thinking on my part, for I have always dreamed of standing at the head of such an army, flying the colors of heroes long past." "You should listen to your dreams, they speak to you of who you are," I said with a secret smile. "Not all the priests were taken, and not all who were taken remain imprisoned." "You know where to find a priest?" asked the general, hope lighting his eyes. "My good general," I replied with an ear-splitting grin, "I am a priest." Our plan was to focus on skirmishing tactics, hit-and-run using our faster airships and heavier weapons. With Llrona's help, I quickly redeveloped the eighth ray disrupters, and she, brilliant thing that she is, found a way to project concentrated beams of this energy, that could be focused on a ship without launching ordinance. Car Than had succeeded in building a number of sky fortresses before Jahal was razed, and these were to be the flagships in our assault. We would drop the mercenary army at the plains of Lurhann, some one hundred miles from Dar, using merchant vessels, privateers, and transport barges. The sky fortresses and other swift, high-flying vessels would be twenty miles above, ready to make their move upon a prearranged signal. If all went according to plan, we would lure the occupational forces out of Dar, and away from the sacred temple of Bar-Darras, which even now they defiled with their profane touch. I would take one of the light ships and fly it into the temple after they had been lured away, and from there make my way to the Sepulchre of the Blessed, where our heroic ancestors lay. By secret paths known to the priesthood, I would shepherd the army of ancestors to Dar, where we would re-take the city while the defending forces of Helium were engaged with the pirate fleet of Daxor. It was not a brilliant plan, but after we finished working out the fine details, it seemed to be a workable plan. It was all we had, for one last stand against Helium. As we made ready to embark, the Jeddara herself came to me with robes of the purest white, and ornaments of fine gold. By her hand I was anointed, and by her hand I was vested. My harness shone with the fire of a thousand jewels, and upon my head was a headdress in plumes of white, showing that I was not only a priest and noble, but an odwar as well. My weapons were of similarly fine quality, having been quickly made to my specifications by artisans who had been captured during the plunder of Dar, and whose freedom they owed to my raid upon the Warlord's manor. Watery blue aquamarines, brilliant sapphires, and fiery white diamonds ornamented the details of my panoply, so that in the first rays of the rising sun, as I took to my airship, it might have seemed that the very stars that faded in the heavens had come to rest upon my shoulders. Our armada flew at a steady pace, for our timing required that all parts be coordinated exactly. To outstrip the lesser ships would be to reveal how many new and mighty craft lay in our group, and we had taken pains to conceal their true magnificence under coats of rusty paint and patches of mismatched hull armor. Were Helium to learn how many ships had survived the war with Dar, that were now returning to her blessed walls, they would dispatch an armada against which we would have little hope. It took us two days under best speed to reach the staging ground, where the ships of the line were to wait until the transports got into position. Another day was spent in tense anticipation before a signal came by heliograph, telling us that the occupying forces were on the move. I took to my little one-man ship, readied the ninth ray banks that would keep her filled with breathable air, sealed the hull, and took to the sky. She was the same model as the one we had sold Van Daar, built to take full advantage of the ramjet engine design. Without the adjustments we had made for his craft, mine could accelerate at nearly the force of three earth gravities, which would be uncomfortable for me, but deadly to any creature native to this world. She was the fastest ship in the world, built to surpass the speed of sound, and able to maneuver like a hummingbird. On her nose had been painted an ensign meant to represent a charging calot, for the speed of these dire brutes was the only thing to which the red men had to compare it. Faster than an arrow, faster than a shot, I rose up into the heavens so high up that the great red round orb of the world dropped away like a child's ball that fell from my hands, and the nearer moon seemed close enough to pluck from the sky. I held my position, using a miniaturized version of the telemetry systems used by martian observatories to see the happenings of other worlds, and watched the battle unfolding below. From time to time I checked the batteries of my ninth ray reservoir, as that mysterious force was not only the key to my breathing but the fuel for my engines, now that I was beyond the grip of the planet's thin atmosphere. The science of weather manufacture is well known upon Barsoom, but utterly unfathomable to a man of earth who grew up in the days of the so-called information age. Our understanding of science is so completely different from theirs that it makes translation nearly impossible, and fantastic as it may sound, the Warlord's tale of the Atmosphere Factory is as accurate a description of this technology as I have found. While I have, to this very day, some difficulty with the core concept of an energy field distilled from sunlight mixing with the ether of space to create a breathable atmosphere, that was indeed how my ship got the air and fuel it needed. Just as we had hoped, the airships loyal to Helium moved to a position over the amassing army, preparing to face the ragtag fleet and then to begin dropping munitions on the ground troops. Our flagships had taken a position high in the stratosphere, their underslung gun batteries taking aim, not at the battleships moving to face our ground forces, but rather to destroy those reserves which flew over Dar and Bar-Darras. Our city was already in ruins, and the damage to our hostage citizens was little in comparison to the joy of watching those mighty hulks twist and burn as they plummeted a mile or more to the shattered earth below. Our smaller high destroyers moved to intercept the advancing fleet even as their reserves were being cut off. Quickly their ranks were cut in half as fire blossomed from the decks of scores of ships, their guns too cumbersome to allow any return fire the the ships which flew higher and faster. Meanwhile, the older ships were moving into accepted formation, ready to trade broadside for broadside with the advancing armada, while our sky fortresses remained nigh untouchable artillery platforms from which to batter the remainder. We used no other super-weapons in this campaign, for we wished to hold them in reserve for coming conflicts. Heavy cannonade was more than sufficient, for disposing of an occupying army whose main support was largely cut off, believing the enemy now essentially subjugated. I saw the opening we had desired, and turned the nose of my craft earthward. Like a shot I raced, though not so swift as she might, taking an erratic, zig-zag pattern to avoid any attempts at artillery fire as I moved toward Bar-Darras. The enemy had taken up those gunnery emplacements which still remained, and much as it pained me, I had to destroy those phallic bastions of moral virtue, which stood as triumphant monument to the proud and loyal guardians who did not attend the festival each year, that we might enjoy our pleasures with a free mind. My ship had been designed to carry four, but as no one but I could survive flying her, the additional space was made into a magazine for a bow gun that I could actuate from the yoke of my craft. Soon, with the assistance of artillery barrage from the massed sky fortresses far above, there were no defenders left to prevent my entry, and I took my little ship to the sanctum sanctorum, where it had been our highest law for a thousand years that none may fly overhead, nor to land. Were our need any less dire, I might slash my own wrists, rather than betray that sacred law, but I knew the reason for the law was to protect the Sepulchre of the Blessed, for the ancient cauldera of this volcano was made to be the very model of the valley Dor, in which the blessed dead were believed to await their families. Down the shaft of the volcano I descended, my little craft finding nothing but bare walls for what seemed to be a half mile's descent. Finally, the well opened up to reveal a mighty cavern, and in this cavern lay the million greatest warriors of Dar. No warriors of Helium defiled this sanctuary, for the places of the dead are often abhorrent to the red men of mars, who like no reminders of their own dying world. I landed my craft and looked upon the splendour of the shining sea of Korus, made in perfect miniature replica by laying down several tons of quicksilver, much as was said to be in the tomb of the first emperor of china. On the banks of this rippling sea were row after row of proud and noble warriors, their limbs straight, their bodies perfect. They remained frozen in time, their only shrouds the silk banners which flew when they marched to war. A million soldiers or more, enough to challenge mighty Helium. I strode past the revered dead towards the mighty temple of the sepulchre, whose gold walls and jewel encrusted ornaments had been the source of some interest. Doubtless the fresh water below the citadel was of greater concern, this was simply the petty vandalism of low class panthans. Within the temple lay the riddle of the elixir of life, if I could unravel it. The elixir of life is one of the great mysteries of the temple, which I was taught once I had been anointed to consecrate the union of Suthor Raas and Kayla Zo. It was taught, as all the lessons of Bar-Darras were taught, as a metaphor for how life was to be lived, an allegorical lesson in proper conduct and thoughtful manner. I will not reveal the details of my lessons to you, for it is not my place. Our sacred mysteries are the mysteries of Bar-Darras, and not for the world to own. Within the sacred metaphor lay, however, a cunningly concealed grain of truth. The principle of the ninth ray, as I have touched upon above, is also the principle of a planet's life force, what we might call the "Gaea Principle". All creatures absorb the solar ninth ray, plants getting it directly from the sun, animals from the plants, and men from plants and animals alike. This secondary ninth ray, absorbed and redistributed through living cells, takes on certain qualities, which if properly mixed, can spontaneously create new life. This was the secret Ras Thavas discovered in his research, which led to the creation of his monstrous synthetic men. The alchemist-priests of Dar had come upon this same principle long ago, but had largely discarded it as meaningless trivium. It was discovered, however, that if the ninth ray were taken from a being, their body would not decay, for the forces of decay are the forces of predation. They would remain whole and perfect, until that same balance of energy was restored. In the sacred Temple of the Ancestors upon the shores of the replica sea of Korus, there were scriptures describing this mix of elements, and how to restore life to those so preserved. I was aghast to find that the ancient scriptures had been written upon plates of beaten gold, which vandals had stolen when they desecrated the temple! High above, I knew, the battle raged on, the entire outcome dependent upon my being able to decipher these ancient texts, texts which even now had been squandered on cheap drink and cheaper women, and hung about the necks of unsympathetic nobles! I fell to my knees, a scream of real anguish ripping from my lips, as I found myself thwarted by the cruel jest of fate. The army of ancestors would not awaken. Dar was lost, and with her, any dream I may have had of having a home. I lay there, pounding my fists against the cold marble floor until my knuckles were bruised and bloody. Somehow, I found the pain focused me, gave me a clarity which I had lacked. I had, among my priestly vestments, a whip of many thongs, made from plaits of scarlet leather and hung with weights of soft gold. Its role was largely ceremonial, but it was quite functional. I stripped out of my fine silks, unbuckled the rich harness heavy with gold and jewels. I lay aside my weapons, and naked as the day I first set foot in the pits below, I walked outside to where I could see, in the dim rays of sunlight which feebly worked their way in from the shaft above, the thousands of generations of ancestors. Uttering one of our most sacred prayers, I began to flay myself, castigating away the doubts, the hopes, the wants, the desires, which made me unclean, unworthy to serve. Every blow brought me further into the moment, stripping away my fears for the armada, my dreams of restoring Dar, my hope to ask Kayla Zo, as a free man, that which now she was free to hear, as her husband the jed was no more. I let go of my fear, the dread deep within me that by coming here I had unleashed the horrors of my own world upon an innocent people. I let go of the self doubt and self loathing which made me question my worth, which made me wonder if I was pacifist, or coward. As the layers slipped away, I found one last lingering doubt, the question of whether I was worthy to walk the ochre sod of Barsoom, or if I had willfully turned away from some other afterlife, seeking escape in this valhalla about which I had read and dreamed so much. Finally, as the blood flowed freely down my back, I was just a man, with no past, no future, save the moment of the lash. I remembered the rites of Bar-Darras, and in the clarity of the moment I understood. Every year, we all enacted the secret, each of us taking some role to play in the sacred texts. The bulls, the devils, the ladies and the lords, we all had our parts to play. Our faith was the allegory, not the elixir. We had broken away from the faith of the Therns, and used the strange imagery of their religion as a framework for explaining what was learned by the ancient alchemist-priests of long ago. Plant man and white ape were to us what sun and moon had been to the philosophers of earth, merely codes to keep secret the formulae that they knew. I knew, and I understood what must be done. Beneath the quicksilver lake were huge reservoirs of ninth ray elements, ready to be mixed and released as a vapor which would permeate the dead. Within the temple lay a secret room, which all of the gold and jewels were meant to hide. Let invaders plunder what they will, for the wise man knows that gold is worthless unless it gives you pleasure, and the dead take no pleasure in such trinkets and baubles. Replacing my vestments, I returned to the mortuary chapel. In the shrine, I found a mural, depicting the sacred valley Dor. To one side were plant man and white ape, to the other side an ancestor waited patiently for us to join them. Between was the same silvery lake, fed by a waterfall from the heights of the Otz mountains which encircle the lost valley of the dead. Searching carefully, I found a crack within the water fall, which I knew to be a keyhole, for the keys used upon Barsoom were miraculous things like tiny needles, their teeth so small as to be almost invisible to the naked eye. Such a key I had, gifted to me by the Jeddara herself, for none other may decide if the revered ancestors might be awoken from their dreamless slumber. Inserting the key, I rotated it clockwise, and then pressed in on the plant man and white ape together. The two figures slowly receded, until there was an audible click, and the wall split open before me. Outside, I could hear the gurgling sound of a thousand gallons of liquid mercury being siphoned away, to reveal the mighty glass tanks which held the precious life force. Within, I found what appeared to be a simple altar, of the sort we kept in every home. None of the figures were bejewelled, nor particularly artful. I removed the figures, for they would play an important role. When plant man and white ape combine, the white devil is their offspring. The white devil is the negative force, the antipathy or dolor which counteracts good life. 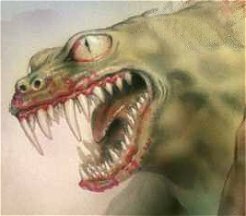 As the Holy Therns were themselves anthropophagists who thought themselves related to the strange creatures which dwelt in Dor, so the icon of the thern was the principle of the devouring entropy, the worm which gnaws its own tail. Thus, to draw the life from some new candidate, one must place the idols of white ape and plant man together on the funeral altar, thereby creating the counteractive ninth ray force which would draw the life and light from a body. When bull combines with cow, abundance is created. Abundance carried over into the union of lord and lady creates blessed life. In the marriage of Suthor Raas and Kayla Zo, the thought was to create powerful offspring, but here the secret was revealed. Bull and cow upon the funeral altar, then lord and lady in the same place. I went to the first marble slab, and pulled aside the ancient silk hanging which covered him. I was shocked to see a pale face and light brown hair, features so much like mine he could have been my brother. So ancient was this temple, the first ancestors so entombed were of the now lost race of sea-faring explorers who once built their cities upon the shores of the now dead sea. Such a city had once Dar been, and she was proud of her ancient heritage. At his head, for the sun shines ever from above, I placed the sacred icon of cow and bull. First the cow is set, then the bull comes to her. Like a child playing out his fantasies through dolls, I repeated the ancient rituals exactly, until the two figures somehow activated a mechanism hidden within the slab. A hexagon of material had sunk, exactly the size and shape of the two figurines put together. I placed them so, and then turned them, the countersunk hole being part of a larger circular formation which rotated freely. There was a click, and I heard some mechanism humming in the altar slab, as the two figures were pushed back up out of the opening. The hexagon was still there, but now a square peg had risen up out of it, which matched a hole in the combined bases of lord and lady. I set them in the place of the cow and bull, and turned the assembly once more. A light suffused the slab, and the ancient warrior opened his eyes, drawing in a long shuddering breath! "I awaken!" cried the ancient, as the light faded from his resting place. "Is this, then, the blessed land of the dead?" "You have slept long ages, oh warrior" I said to him, as he clambered from his seat. "The people of Dar crave your aid, for we are in the most dire of straits." "You are a priest of the temple," commented the warrior, looking at me, "but your trappings are strange to me, though you seem to be of my race. Who are you, and what need has called Vor Vasq back to the world of the living?" "I am not of your race, though priest of the temple I be. Long ages have past, the ancient seas have become barren plains, and now ships sail upon the sky. Your children's children for a thousand generations have been a beautiful race of red skinned folk, whose likeness you may see entombed here. Though I look to be your blood kin, I am of a land far removed, and have never before in this place seen anyone who was like me. I am called Jor Komak, and I have been sent by the Jeddara of Dar to perform this errand. You are the first to be called, but not the last, for to free Dar from her enemies, the very hosts of the ancient must be called forth." So it was that I had long work, repeating the process a million times, though as we progressed, I found that many had been entombed with idols of their own, so that they might hasten the process of mustering an army. Soon we were gathered together, warriors, savants, scholars, priests, and kings, the very greatest of all Dar's history, risen from the very grave to defend their homeland from invasion. Never before have all the assembled hosts of the dead been gathered, and it were only our most dire peril which led the Jeddara to this fateful decision, which was to us like opening the gates of paradise to summon Adam and all his kin to fight, bleed, and die for us. Deep within the temple precincts were small skiffs meant to carry us by the subterranean waterways to the pits of Dar. Before we went, we scoured the sacred mountain, destroying every last Heliumite who had soiled her gardens and palaces. The ravages done by the invaders to this most holy of lands was all the reason I needed to convince them of the righteousness of the Jeddara's action. It had been a full day by the time we had made ready the army and moved to scour the temple of the heathen invader. The sounds of artillery shells still thundered and echoed across the mountain valley in which Dar sat, but all enemy airships had been destroyed or captured. Now, as our panthan army marched upon the city, the object was simply to besiege the besiegers, destroying any artillery or gun emplacements which might help the invaders to hold our city from those who hoped to take it back. It was possible, if we had been vigilant, that no scout or runner managed to escape the barrage, but I was doubtful of this. A scout flyer was no larger than an earthly surfboard, easily concealed in a building or under cover, and once night fell, could be swiftly away before any observer noted their departure. So it was that we had assumed, in our plans, that the forces of Helium would move against us once more. 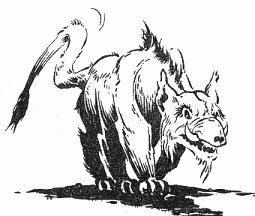 We waited in those secret vaults until my chronometer read nightfall, and then we crept silently by small groups of a few dozen up through the pits and into the streets. We swept from building to building and from pit to pit, slaying all we met who wore the metal of Helium. As we moved, our ranks grew, the citizens of Dar taking hope in the knowledge that the priesthood still stood and the Jeddara still lived, without both of which such an event could not be possible. Our once proud city numbered half a million people, and a million more had come to swell the ranks, against a paltry hundred thousand who held the captured city as spoils for their masters. By daybreak, from every pinnacle and parapet, the banner of some hero flew, showing the distant navy that my task had been successful. The sky fortresses and swift ships of Dar were able to make their way to any point on the globe in only a few hours. We could choose our battleground with impunity, so long as it were only air combat. It had been this edge which allowed us to so long hold out against the overwhelming numbers of Helium. As soon as the signal was sighted by our stratosphere spanning allies, they moved to the next agreed upon mustering point, while the army finished its march to the gates of our battered city. Having driven out the invaders who had defiled our home, it was time to take the war to the Jeddak of Jeddaks who had chosen to be our enemy. As Car Than, jed of Daxor, and deposed prince of Zodanga, was our benefactor in this assault, there was a quid pro quo in effect. Having retaken Dar, now we turned to Zodanga, and from there we would storm the very gates of fair Helium herself. In this, once again, I was to make use of my charging calot, to go ahead to Helium and give them reason for consternation. I had in my possession a number of thermonuclear warheads, made to be used with my ship's bow gun. Each one was powerful enough to destroy a battleship, if it were properly placed. I had enough rounds to lay waste to a great fleet, if I had opportunity to do so, or to destroy several great buildings. They were a secondary objective, but the shipyards which built and maintained these mighty fleet were an important step in removing our enemy's ability to fight an effective air campaign, and without air support, their army was helpless. The fastest scout ships of Helium could only fly four hundred miles an hour. Their warships, dreadnauts, and supply barges could travel at perhaps one hundred and fifty miles an hour. For news to reach Helium of our assault on Dar, even the most able pilot would need several days. My ship could fly at nearly fourteen thousand miles per hour, while the great sky fortresses flew at a speed of six hundred miles. We would be upon them before word could spread, and if the great god Bar-Darras truly favored us as his chosen people, we would have crippled their fleet in short order, forcing them into a ground war without recourse to aerial tactics. As I flew on, I said a quiet prayer for Simon Hill, who rolled disquietly in his grave. I had brought terror weapons to this world, and while I jealously guarded the secret of their manufacture, there were only two options. Either I introduce to this world the stalemate of cold war politics, or else I had to kill the Warlord. The advent of the Warlord to this world a hundred and fifty earth-years ago (the orbit of Mars requiring roughly six hundred and eighty seven days to complete, thus making each year of the Barsoomian calendar nearly twice that of Earth's own) created a terrible imbalance in the power structure of this world. Through his fierce sword and powerful personality, he had created more than just an empire, but a mighty super-nation against which no other kingdom could stand. This superkingdom revolved around his puissant charisma, however, and like Charlemagne, upon his death that empire would swiftly disintegrate. 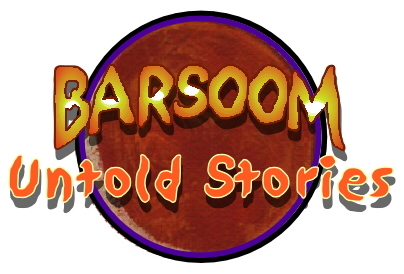 Otherwise, it was necessary that a second super-nation arise to counter the first, one too powerful to be fought successfully, one that could reestablish the ancient system of checks and balances which had caused unceasing war upon the face of Barsoom, yet left ancient cities older than all of terrestrial civilization. They fought with swords for personal glory, and left behind monuments of their deeds, but Zodanga was left to the gentle care of the savage Thark, who despoiled her without mercy. The men of Helium rebuilt what had been lost and reinstalled Zodangan nobles of their choosing upon the throne, but never again was she the same. Her people were broken, haunted by that experience. Time and again this pattern was reinforced by the Warlord, who had battled from pole to pole and under his banner rested the graves of a hundred mighty nations, all in the name of what he termed peace. To claim the peace that I desired, I had to show him war so savage and bloody, even the dour and taciturn people of Thark would be appalled. I had to show him the nightmare I and my entire generation had grown up in the shadows of, because nothing less would threaten the pyrrhic victory that made war unpalatable. So long as one side thinks that they can win, war is an inevitability. Somewhere, in my mind, I could not bring myself to assassinate the Warlord of Mars, and so once again, in the name of honor and pride, I chose the greater of two evils. I had gone from being a slave, to a champion, to a savage murderer, to now, a purveyor of super-weapons. No wonder the epithet 'calot' is an insult. My bloody-handed task was done swiftly enough. The mighty battleships which flew over the twin cities of Helium fell in fiery wreckage under my onslaught, and for good measure I destroyed the tops of the two needle-thin spires, those two towers of Helium, which were both the symbol of her civic pride, and the primary docks from which the military embarked. After the third strafing run, the batteries set to defend the city from air assault began to open fire, trying desperately to strike me down before I destroyed another craft. My first run was the most brutal, for it was easy to target several colossal ships in a single pass. As the targets grew fewer and farther apart, I had to take increasingly greater risks, as a hail of bullets and cannon shells flew through the air about me. So wide spread was the empire of Helium, only a fraction of her ships crowded the skies over her stately head. It was this reason alone which allowed me to destroy her larger ships and several strategic emplacements with the scant hundred bombs that I carried, each no more powerful than the ordinance dropped by warships during a siege, but so much smaller and more compact. My mission complete, I turned back to join the fleet which even now was making its way for Zodanga. I made my objective in a short time, and slowing my speed to that of a normal light craft made to dock with the flagship. Car Than was elated with my news, for Zodanga is close by Helium, and were any ships to come to the aid of the forces we had put under assault, from Helium is where they would be found. Limited to smaller craft and troop transports, they could still muster an impressive force, but would lack the significant firepower of those naval batteries. By the time our primary fleet had reached Zodanga, the sky fortresses had leveled every battleship which flew, and many of the lesser frigates, carriers, and destroyers were damaged or destroyed as well. For the most part attention was being focused on the gun batteries atop many of the mighty buildings, for the lesser craft lacked guns powerful enough to truly threaten the fortress cannons, although they most certainly made the attempt. One of the reasons a sky fortress is so slow in comparison to my own swift little vessel is the thickness of its hull armor, which makes her heavy and cumbersome. In close combat the sky fortress is a clumsy brute, quite vulnerable to attack from lesser ships, but from high up and miles away, her armor is thick and her guns are powerful. She is indeed a fortress of the firmament, a fact which still swells my heart with pride. My role in the remainder of the campaign is that of a chronicler, for I had done my part and now could only wait for others to complete their own chapters. Our ancestral army marched upon Zodanga while scouts flew in innumerable directions, informing our allies that Dar was not yet lost. Helium tried to rally her forces, but the sheer savagery of those first few blitzkrieg strikes had overwhelmed the people of that great city. Somehow, I was named the grand war councilor, and all the blame for this bloodshed laid at my feet. All I did was rescue the three women I loved most, and stand firm by those who had befriended me. To do this, I had compromised my morals and done things that, on my own world would be called acts of terrorism, war crimes, and even crimes against humanity. I was not on my own world, however, and among Barsoomians, any method used to achieve victory in warfare is still victory. So it was that I was clad in the grand panoply of war, wearing the white silks and gold ornamentation of the priesthood, to preside in state over the armistice negotiations, as Helium had no desire for a pyrrhic victory, and we of Dar, Daxor, and Zodanga had nothing left to lose by it. Yet again, my path crossed that of the great Warlord, who in the fine panoply of warlord and emperor presided in state over his own people's quarter. With him stood his friend and ally, Tars Tarkas, jeddak of Thark and statesman supreme, as well as the venerable and beloved Tardos Mors, jeddak of Helium and grandfather of the incomparable Princess of Mars. By my side stood Zamran Gauth, jeddara of Dar and Car Than, jed of Daxor. This time, no pleasantries were exchanged between myself and my fellow earthman. We were not two expatriates of earth come together under strange freaks of circumstance, but chieftains and generals who represented our assembled hosts. Tars Tarkas stood as the mediator for the side of Helium, for while he was an ally of their people, he had no interest in the conflict. I mediated for Dar, in that, while I had a vested interest in the conflict, I had no desire for petty revenge or mere dane-geld. We both were hard put to keep the negotiations from dissolving into bloodshed, as recriminations flew and ancient grudges rose to the foreground, but some how, over a grueling week that made my time in the pits of Bar-Darras seem like a pleasant memory, we came to an agreement. While Car Than was an enemy of Helium, we of Dar were not, and so in assaulting us, Helium had been in the wrong. Helium had despoiled our land and desecrated our temple. It was finally agreed that rule of Zodanga would return to Car Than, if he could hold it, for as the son of Than Kosis he was the rightful jeddak. Restitution would be made for the sacking of the temple, for such had not been the orders of the Warlord, and he was as appalled as the Jeddara to learn of its desecration. The slaves taken in warfare by Helium, who were former citizens of Zodanga and Dar, would be freed, if they could be located, and returned to their homes. The ships which had been captured by Helium were to be returned to Zodanga, Dar, and Daxor, in the case of the ships from Jahal, or else an equal number of ships would be given over in their stead. No other restitution would be paid on either side for the damage done to civic or military targets, and certain violations of holy law, including bringing weapons into the Temple of Reward, or overflying the Temple of Bar-Darras, would be politely ignored by both sides. By the end of our negotiations, I had the utmost respect for Tars Tarkas' ability as a negotiator, and said so to him. He in turn complimented me on my statesmanship and war craft, the latter of which I dismissed as little more than artful chicanery and desperation on my part. I was no general, nor warrior, nor gorthan, but merely a loyal slave who wished beyond all else to return to his home. "I thought from your trappings you were an odwar," replied Tars Tarkas, his horrible insectile head bent low to better examine me, "and these are the ornaments of a great noble, a prince if not a jed. I was led to believe that you were a priest of the first order as well, highly esteemed among your adopted people. How, then, do you still cling to the statement that you are a slave?" "All men are slaves, Tars Tarkas," I replied, shrugging, "and no amount of finery can change that. The only true freedom we have is to choose our masters. You are a slave to the state you rule, your friend is a slave to the heart which beats only for his princess. I too, am a slave, though I do not know if my masters will still have me." "Then I wish you well, Jor Komak," replied the mighty Thark, rising up to his full sixteen foot height, "for the master who refuses such a slave is a poor man indeed." My days were filled with silent nagging doubts as I pondered the Grand Thark's wisdom. What was my place now, and could I return to the way things had been? Our armies returned home, the holds of our ships filled with newly freed slaves. From every rooftop of Zodanga, the colors of the former royal family flew as word spread that the son of their Jeddak had returned. In Dar, the bright pennons of our revered ancestors flew gaily over the rubble, and we were forced to begin the arduous process of rebuilding our ruined city. No thought of reward or punishment was in any mind for half a year, as even the blessed dead strove to recapture our city's former glory. That not all of the ancestors were mighty warriors was a blessing, for among them were the great architects, philosophers, artists, and lawmakers of our people as well. With their guidance, the land was remade, the city rebuilt. Her bright towers rose as tall and proud as ever before, the colors of her heroes flying from every roof and awning. In the great central plaza, a new statue had been erected, to go with those that survived the siege. In one palace was found a great bronze rendering of me kneeling before Kayla Zo, which was given a place among the monuments and public works of the city square. Below it was mounted a plaque, on which were rendered my words to Tars Tarkas. Though it was deemed a fitting tribute to my calot's heart, it left me with a hollow feeling inside. Suthor Raas was dead, that had not changed, and in the interval, Kayla Zo had learned of his fate. The man in that portrait existed no more than did Simon Hill, and his memory was just as uneasy. I so desperately wished to kneel before her as once I did, but my strange transformation of self made me unyielding. I was now a master, and could not go back to slave. Because her husband had died before an heir could be born, Kayla Zo was proclaimed jed of Gohus in his place, and much of her time was in that seat, seeing to the administration of her kingdom. I was overwhelmed with duties, as savant, priest, and war minister to the Jeddara. Always at my side, if it were allowed for her to be there, was Llrona. She became my secretary and advisor, her knowledge of history and science a great boon to me in the many meetings in which I had to participate. She willingly attended to my personal needs as well, although she could easily have left that to a valet or other body slave. Hers was usually the first face I would see in the morning, and very often the last one I saw at night, and while we were always as close as a whisper, no hint of impropriety passed between us after that night we fled the pits of Helium. Just as I myself, she was awaiting the final judgment of the Jeddara, which would define whom I was free to court, and for whom I could proclaim my love. By the traditions of Bar Darras, all priests are slaves, at least when they are initiated. A priest's first duty is to serve the gods, and then the community. A free man or aristocrat would be inclined to serve himself first, and so only those accustomed to service as their first priority were initiated into the temple. I held great honor and responsibility, yet I was still but an orad, until the Jeddara herself pronounced a reversal of her judgment. Were I to remain an orad, I could never woo Kayla Zo, and without her husband, I could not even serve as her sacred bull. Were I a free man, I could not pronounce my love for Llrona, for I would be a priest of the inner temple, and thus equal in rank to a great prince. All remained unspoken, waiting on the swift wings of the Jeddara's judgment. That awful day came on the eve prior to the Festival of Bar Darras, when the Jeddara called forth all those who had served the kingdom with distinction. Nearly a thousand names were called before my own, each a person who had done some exemplary service, and many who had performed in exemplary fashion throughout the entire conflict. Some were given medals, some were given praise, some were given freedom, some were given title or rank. Even Llrona was called, her service having been noted by the Jeddara's ever watchful eye. She was given position as an advisor savant, one of the scholar adepts who served the Jeddara by staying forever at the forefront of art, science, and philosophy. It was a great honor, but in my estimation no more than she deserved. Her career had been stifled by prejudice, not ability, and I cheered her position more loudly than any other in the hall. What she was not given, I noted grimly, was her freedom, which echoed disquietingly with my own situation. Whether I was freed or not would drastically alter my relationship with her, as it would with Kayla Zo, and I am not so noble a man to say that I did not want both. Finally, my name was called, and I stepped forth before the throne of the Jeddara. Clad in my fine raiment, I knelt before her on one knee, my palms flat upon the cold marble floor, my head between my hands so low that my brow was very nearly touching the tiles as well. The clerk gave a list of many deeds which I had performed in service to the kingdom, many of which I had forgotten myself. One deed, however, went unrecorded, and it was of such surprise to me that I looked up and corrected the mistake. "A deed has occurred, which has not been recorded by the clerk!" I declared, as the recitation was finished. "When I awoke the revered ancestors, I knowingly broke our sacred law. I flew my craft over the holy temple, and by the law of the temple, my life is forfeit!" "But you yourself declared that law in abeyance, war minister" said the Jeddara, as she looked down at me from her golden throne. "In the armistice treaty it was declared that no one was to be punished for that transgression during the time of the conflict." "I did so for the sake of the accord, to give a concession to the Heliumites, majesty," I answered, standing erect and facing her now. "I am a man of Dar, a man of honor, and a priest of the temple! For any one of these reasons, I should not keep silent, even though my silence were allowed." "So noted, Jor Komak," answered the Jeddara, who then stood, adding, "are you ready now to hear my judgment?" I indicated that I was, though I felt as though my heart had leapt up into my mouth. She strode down the ramp that sided her dais, to stand before me and placed her hand upon my shoulder. "You have been my servant, my champion, and my councilor" she said to me, smiling warmly. "You have done this, time and again, with no thought of your own reward, and in fact have heaped your own honors upon the heads of others, rather than claim those rewards you were due. You have said that you have a calot's heart, but I do not think that is so. Even a calot craves reward for its obedience, even if that reward is simply the affection of its master. You are a man, Jor Komak, such a man as has not been known in many an age. In slavery, you are ennobled, in war, you bring peace. In darkness, you have brought me hope, and you have brought hope to all of your people, only so that you could return to kneeling before your master. Any other man would ask freedom at least, if not rank and prestige, for these deeds, and it would not be thought too much, but in your eyes, I see only the plain harness of a simple orad. Hear my judgment, and consider it well." She turned, and strode back up to her throne, where she set herself carefully, managing to portray the very height of regality. "It is our judgment, Jor Komak, that you are a free man, slave to no one but your own heart. We further pronounce, that while you have asked no reward, reward you shall have none the less. You are made a prince of Dar, of my very house. Those honors which have been conferred upon you in time of war, remain with you. You are Priest of the First Order, Keeper of the Elixir of Life, War minister to the Jeddara, and Royal Champion. May your name be emblazoned in the Hall of Ancestors, may your deeds be recorded in the annals of Dar, and should you not be lost to war or accident, may you rest among the ancestors, in the Sepulchre of the Blessed. I have spoken." A great cheer went up among the assembled throng, for my deeds were well known, and all of Barsoom loves a happy ending. I turned, to see Kayla Zo standing there, smiling at me, her white teeth flashing as she rendered me her applause. I strode over to her, full of trepidation. I still wanted to kneel, to be obedient to her whim, but I was now not only a free man, but equal to her in rank. The damnable pride which had been invested in me during my time in Helium would not leave me, and so I was forced to say what had remained unsaid for all these long years. "Kayla Zo, jed of Gohus, I have stood by your side since nearly the day I set foot on this world. In all that time, one thing I have wished to say to you, that now I am free to say. I love you, and I have loved you since the very first day that we met. I crossed the black void of space to be with you, and whether you would have me or no, I must stay by your side. If you will not have me as your chieftain, then but say the word, and I will cast aside my princely trappings, and serve you in any way that I might." "On Barsoom, it is customary," said Kayla Zo, after long thought, "that a woman place tests and challenges before her suitors, to know the true strength of their ardor. You have answered every test, bested every challenge, and found new ones by which to prove yourself to me. You have been my slave since the day we met, and you have been my chieftain since you risked all to find me. I am free now as well, Jor Komak, prince of Dar, and so I may say these words, just as I am free to hear the words you have spoken." She embraced me then, and for the first blessed time I was able to put my arms about her, press my lips against hers. A second cheer went up from the crowd upon seeing this, for what had been unsaid between us was still well known. Only one voice was silent in all the assembly, and her heart I knew too well. She could not be happier for me, but still her heart was breaking. I gave my princess a look pregnant with silent meaning. She returned that look with laughter in her eyes. We turned to leave the hall where we had assembled, my arm about her, neither of us looking back at Llrona, who stood forgotten by all. As we reached the door, I glanced briefly in her direction, calling out to her, "Well, what are you waiting for? I know a sorak whose teeth need polishing!" ERB Text, ERB Images and Tarzan® are ©Edgar Rice Burroughs, Inc.- All Rights Reserved. and all associated characters and their distinctive likenesses are owned by ERB, Inc.
No part of this Web site may be reproduced without permission.